Dan Martin (Garmin-Sharp) survived his worst period of bad luck and rebounded with a solo attack to win Il Lombardia today in Bergamo, Italy. 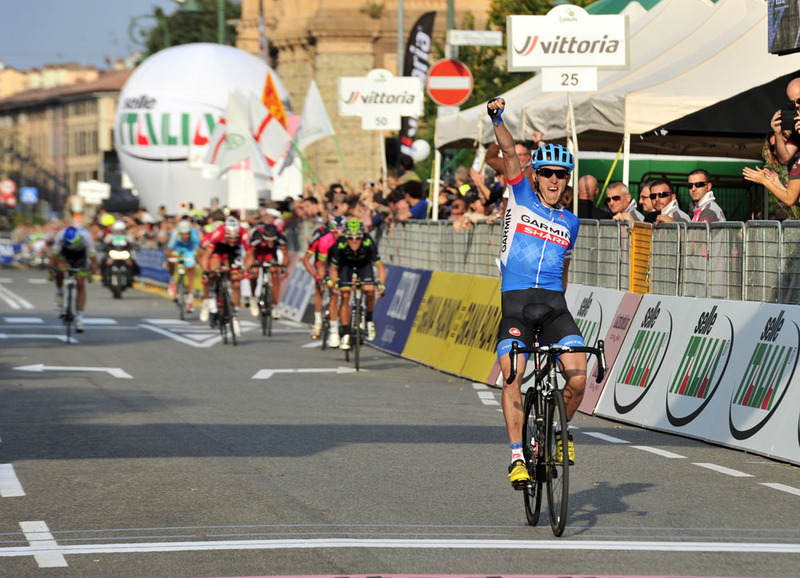 Martin changed his luck with a solo attack 800 metres away from the finish line in the centre of a sunny Bergamo. He followed an attack by Philippe Gilbert (BMC Racing) and the charge of Rui Costa (Lampre-Merida) with his move with Bergamo’s Città Alta at his back. He put to rest 12 difficult months. Last year in Lombardia, he crashed on a slick right-hander coming into Lecco. In Belfast for the Giro d’Italia, he led Garmin, but fell with the team in the time trial. It was only two weeks after he fell leading Liège-Bastogne-Liège through the final left-hand bend in Ans, Belgium. “The team kept behind me, too, and believed my luck would change. It’s been a difficult year, but in a sense, that’s made it easier to be motivated and train hard. A lot of people get tired mentally,” Martin added. Martin’s palmarès now shines with the 2014 Giro di Lombardia, or Il Lombardia as it is now known, and the 2013 Liège-Bastogne-Liège. What is next for the 28-year-old? He will keep aiming for one-day races because he said that he loves the tactics and risk-taking involved. The one he wants to add to his palmarès is Flèche Wallonne, the spring classic between the Amstel Gold Race and Liège-Bastogne-Liège. “Lombardia is one of the first cycling memories that I have,” said Martin, the first and only Irish rider to win since Sean Kelly in 1983, 1985 and 1991. “I remember watching it when I first started cycling. It’s incredible to have in on my palmarès. “I wanted to win three races at the start of my career: Liège, Lombardia and Flèche Wallonne. I only have one left, that’s incredible to say because I’m only 28 years old.